The shouted query comes from a girl in the audience at the early show of the Grateful Dead's appearance at the Fillmore East on May 15, 1970. The group is a few songs into an acoustic set (OK, Phil Lesh is on electric bass and Pigpen is playing tasteful B-3 organ on some songs) during which they've already performed a late '20s Texas blues romp by Henry Thomas called "Don't Ease Me In," a slowed-down version of the venerable folk tune "I Know You Rider," and Lightnin' Hopkins' funny and oddly suggestive "The Rub" (also known as "Ain't It Crazy"). The New York crowd has been mostly quiet and respectful--must be those acoustic guitars and the relaxed camaraderie of the players onstage. "Shut up!" Garcia mock-snarls in reply, drawing laughter from the crowd. "The unkindest cut of all!" Bob Weir remarks, before Jerry adds, "I don't ask you about your beard!" And then, mere moments later, Bob leads the band in an oh-so-serious and mournful turn on the country weeper "Long Black Limousine"--a song which at that point had been covered by everyone from Glenn Campbell to Merle Haggard to Elvis Presley (though the Dead's arrangement most closely resembles the Flying Burrito Brothers' version). It was a playful and confident Grateful Dead that hit the East Coast in the spring of 1970, in advance of the June release of what would prove to be their commercial breakthrough album, Workingman's Dead. Though their most recent record, Live Dead, had scarcely been out half a year (quickly outselling its three predecessors), this was an at times very different band than the fiery psychedelic beast that had recorded that album in the winter of 1969. In between, some curious things had happened. Garcia and lyricist Robert Hunter, who were living together (along with Mountain Girl) in a cheery house in Larkspur (Marin County), re-discovered their shared roots in folk and country music, and beginning in June '69 started unveiling new tunes that were quite unlike the more musically complex and lyrically opaque numbers they'd conceived for their previous studio outing, Aoxomoxoa. (One could argue, however, that the beginning of their turn toward Americana came with that record's "Dupree's Diamond Blues.") The first couple of songs that pointed in the new direction were "Dire Wolf" and "High Time," both completely different than any songs Hunter and Garcia had written before. Also around this time, Garcia took up the pedal steel guitar and started playing music with John Dawson (aka Marmaduke), a pairing that would soon give rise to the country-rock group New Riders of the Purple Sage, which in its first solid lineup included three members of the Dead--Garcia, Lesh and Mickey Hart--in addition to Marmaduke and guitarist David Nelson, another runnin' buddy from the early '60s Bay Area folk scene. (Garcia also played steel with the Dead from time to time.) Bob Weir, too, was indulging his love for country music during this period, peppering many Dead sets with cover songs ranging from "Silver Threads and Golden Needles" to "Mama Tried" to "The Green, Green Grass of Home," and even playing a few gigs around the Bay Area leading a loose Dead spinoff called Bobby Ace & His Cards from the Bottom of the Deck, which exclusively played that kind of material. Amazingly enough, it didn't seem at all odd that the new country focus of some of the Dead's material still fit in perfectly with "Dark Star" and "St. Stephen" and "That's It For the Other One" and Pigpen's blues and R&B raves--they'd always been fiercely eclectic and never settled on a style or, in the parlance of the time a bag. Pretty early on in the group's existence it became clear that no matter what the group played, that was the definition of Grateful Dead music. 'Twas ever thus. By the end of 1969, there was a wheelbarrow full of other great new songs that seemed to be cut from the same cloth--a weathered and faded American flag, perhaps?--as "Dire Wolf" and "High Time," even as they were actually quite dissimilar stylistically one to the next: "Cumberland Blues," "Black Peter," "Casey Jones," "Easy Wind," "Uncle John's Band," "New Speedway Boogie." These eight tunes, which would comprise Workingman's Dead, were recorded over the course of about ten days in the winter of 1970 at Pacific High Recording in San Francisco--quite a change from the nearly eight months of sporadic recording it took to make Aoxomoxoa. Several of the new songs used acoustic guitars as a foundation, and "Cumberland" and "Uncle John's Band" also revealed a new emphasis on harmony singing--a move certainly influenced by their friends Crosby, Stills & Nash, but also by the rich vocals heard on nearly every classic country record. And by the time the Dead reached the Fillmore East for a one-nighter in mid-May '70, they had two more new songs that really showcased their harmonies--"Candyman" and "Attics of My Life," both of which would turn up on the group's exquisite American Beauty album in the late fall of '70. The Dead's May '70 tour--dominated by shows of Northeast colleges--marked the group's first with the New Riders as traveling partners/openers for what was billed as "An Evening with the Grateful Dead Featuring the New Riders of the Purple Sage." (The Dead pioneered the "evening with" concept; a month later, CSNY tried it, and in the fall, Pink Floyd.) At a number of the Dead's February and March '70 shows, they had tucked a six- or seven-song acoustic set in between two electric sets (the first fairly short, the second longer). But for most of the "evening with" shows, they opened the night with the acoustic set--a warm and friendly way to break in a crowd. Then the New Riders would get everyone's blood pumpin' with their set of outstanding Marmaduke originals and cool cover tunes. Finally, the electric Dead would come blazing through--so free, yet also miraculously tight at just the right moments--with their irresistible dance music, mind-bendingly weird extrapolations, and perfect alchemical mixture of dark and luminous and mysterious and soulful tunes. And at the Fillmore East on May 15, they did it twice--an early show and a late show; the only time they played two in an evening with that format. I was fortunate enough to be on hand for the late show that night. I had turned 17 a month earlier and had one previous Grateful Dead show (the late show of 3/20/70, Capitol Theatre in Port Chester, NY) and one previous Fillmore East concert (Quicksilver/Country Joe & the Fish, 1/24/70) under my belt, so I wasn't quite a "virgin," but I might as well have been. All I had heard by the Dead were their first three studio albums, Live Dead and the one concert. I didn't own any tapes or bootleg albums (yet), and I sure as hell didn't know what the band had been playing on their tour up to that point. I'd never heard of the New Riders, who had no album out and hadn't played east of California before this tour. My earlier Capitol concert was one of those with the mid-show acoustic set, so seeing Garcia and Weir onstage with acoustic guitars to open the show was not a surprise. Still the only tunes from the acoustic set I recognized were "new" songs I'd heard in Port Chester--"Friend of the Devil," which had pretty much become my favorite song after hearing it just once, "Black Peter," and the inviting and the uplifting anthem "Uncle John's Band." But most of the set consisted of traditional songs that were new to me, such as "The Ballad of Casey Jones" (the folk-blues, not the new Hunter-Garcia song), "Deep Elem Blues," two consecutive Lightnin' Hopkins songs, performed solo by Pigpen ("She's Mine" and "Katie Mae"; it was the only time he played two songs in a row during an acoustic set, the statisticians tell us today), and an old bluegrass-gospel tune called "A Voice From On High," which featured Marmaduke on harmony vocals and David Nelson on mandolin. It was like a whole new world opening up to me. It was love-at-first-listen for me and the New Riders--I'd basically never heard any country music at all growing up in the suburbs of New York. A close friend had turned me on to Gram Parsons' Byrds and then the Flying Burrito Brothers, but that was it. At the Fillmore that night, though, Jerry's pedal steel work seemed to chirp and smile, and Marmaduke was such an endearing leader. Bob Weir even came out and joined the NRPS for a couple of songs. I became an instant fan. The Dead's electric set in the early morning hours of May 16 was an inspired, near-perfect melange of everything of the Dead did well, including; "China Cat" > "I Know You Rider" to start (how different this "Rider" is from the early-show version); a perky break-neck "Cumberland Blues"; Pigpen all funky and down-to-earth on Otis Redding's "Hard to Handle" (another song I didn't know); a powerful "Morning Dew," from the first album; an extended take on "Good Lovin'" with plenty of instrumental fireworks; a "Dark Star" that was not at all like the one I knew from Live Dead, but nonetheless filled with incredible passages of delicate and scary "space" and stirring chord progressions that felt familiar but weren't; my first live "St. Stephen"--Yay! Does life get any better than this? I wondered--and then both "Not Fade Away" and a nearly 27-minute "Lovelight," a devastating one-two punch to close that left everyone dazed and delirious. I have absolutely no memory of the short acoustic encore--the gospel song "Cold Jordan"--but as my friends I left the Fillmore East that night, there was no question that I would do whatever it took to do this again real soon. 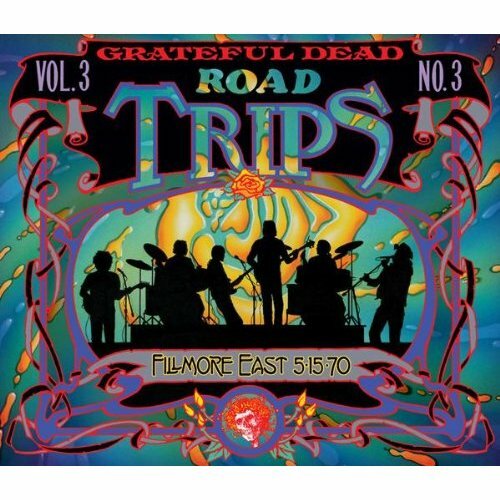 Let's see… Capitol Theatre in June, Fillmore East again in July ("The Dead at Midnight"!) and September, Capitol in November… Hey, I could get used to this! This album was released in June 2010.